You want an adventure holiday that goes beyond the destination. One that allows you to fully immerse yourself in Portuguese culture, connecting with locals and learning to live as they do. One that helps you explore the very best this country has to offer, from its natural landscapes to its delicious gastronomy and ancient traditions. 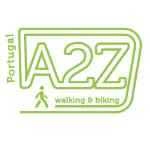 And that’s exactly why we are here.Powered by your passion for travel, Portugal A2Z Walking & Biking was born to offer you authentic experiences in the most exclusive places in Portugal taking you to the most historic and wild landscapes in the country. Portugal is a treasure chest of deep valleys, enchanting mountain ranges, charming villages and unique traditions – and we know the best way to explore them all is at your very own pace through the backroads of the country’s most stunning landscapes. To do that, we use our extensive expertise to design completely custom-made road cycling, walking and mountain biking tours that fit perfectly into your needs and preferences. Discovering Portugal with us means you will travel in a small group (6-12 people), allowing you to stay in unique and special places away from the tourist crowds. It means getting a first-class service with our dedicated guides. And it means having the time to interact with locals, immerse yourself in Portuguese culture and enjoy the best of your favourite activity, whether that’s walking or biking, in a breath-taking scenery. Since the company’s founding in 2006, our team has been dedicated to offering world travellers a fully professional service that leaves unique and unforgettable memories. Our entire team is deeply passionate about Portugal, travel and the outdoors. When we’re not guiding a new group tour, you’ll find us exploring our own country to ensure we can take you to the secret places only locals know about.Today, we offer a wealth of guided and self-guided tours on our website – all of which are fully customizable according to your preferences and needs. Whatever you choose to explore in Portugal, when you travel with us you know we will only take you to the places we like to go.